Published 8 times a year for the mountain biker . Includes product reviews, tips to improve your skills, and helpful repair advice. 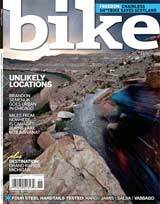 Loaded with spectacular photos and exciting stories of mountain biking adventures, Bike Magazine also offers guides to great places to bike, biking events, and interviews with mountain bike enthusiasts.